Inductive sensors in a plastic threaded barrel design and an antivalent output have been added to Turck’s uprox series of factor 1 sensors that offer the same large switching distance to all metals. 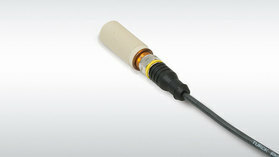 The new sensors combine the benefits of a one-piece barrel design with those of a closed front and translucent end cap. In this way, users benefit from the resulting increased sealing capacity and long service life. The translucent end cap enables status indication signals to be visible from all sides. This saves the user considerable time during commissioning or troubleshooting. The threaded barrel and front cap are made from liquid crystal polymer (LCP), and the end cap from Ultem. Both are highly durable plastics that have had proven use in applications involving a high degree of humidity and corrosive media. The new uprox factor 1 sensors offer here an additional benefit, since the targets used here are often made from stainless steel. The first six device variants in the new design are now available: Three flush and three non-flush models in M12, M18 and M30. For more information or to request a quote, please contact sales@shingle.com.